The world is changing. Once upon a time, business required suits and ties and now it’s not uncommon to see VP’s and C-level officers in t-shirt and jeans, especially on the Left Coast, USA. The pace at which the world is changing is also accelerating. And in this rapidly accelerating, changing world, BRNDVENTURE was born. We are a largely virtual company, and made that decision deliberately for several reasons. One is to be able to work with the best talent anywhere in the world for the good of our clients, whether it’s a subject matter expert from Denver, or a PPC expert in Southern California, skilled writing talent in Boise, or amazing graphic design talent in the Ukraine, the world is quickly losing its borders (The World Is Flat) and increasing its connectivity. Diminishing barriers to offering clients the best is a massive benefit. A second reason is manage cost, which also ultimately benefits our clients. There were two drivers from our personal experience that influenced this decision. For one, our Leadership team had experienced working at another agency that closed it doors in part because of mismanaging its money and saw that agency end up in debt, despite earning approximately $1.5 million in revenue in just under two years. There were of course numerous reasons that went into that (some included hiring too quickly without a long-term justification, spending money on software and tools without a well-thought out justification, and expensive office space). We wanted to avoid repeating this mistake. In addition though, I worked at Amazon for an all-virtual business unit that I helped staff up. In Amazon’s case, they’d built a multi-million dollar facility for customer service, which they quickly maxed out in capacity and needed to rapidly hire more. They had previously used a virtual customer service model seasonally, during the Winter holiday season and decided to make it permanent. Everything was virtual — hiring, training, work, and supervising. Only a handful of people worked at Amazon’s corporate headquarters (about 5 or so). Amazon now employs thousands of employees who work from home on a virtual basis. I didn’t meet my immediate boss face-to-face until I’d worked for him for about 4 or 5 months. Amazing! We’d already had experience working remotely at the previous agency, which was based in Silicon Valley, but I was here in the Pacific Northwest, and Sergio Paliychuk was half-way around the world in the Ukraine. We thought why not approach the entire agency this way? Today’s communication and collaboration tools make everything we need to deliver for clients as easy as if we were in the same room. Google Hangouts and Skype for “face to face” meeting, Google Drive, Dropbox for sharing documents and version of documents, text, Google Hangouts chat, Slack or other tools for instant back-and-forth communication, you can even call on the phone via WhatsApp if you can’t make a phone call via cell or landline easily. What’s more, we’ve already used this model to deliver hundreds of thousands of deliverables for multiple clients. And so here we are, bravely carving our path through the digital wilderness. 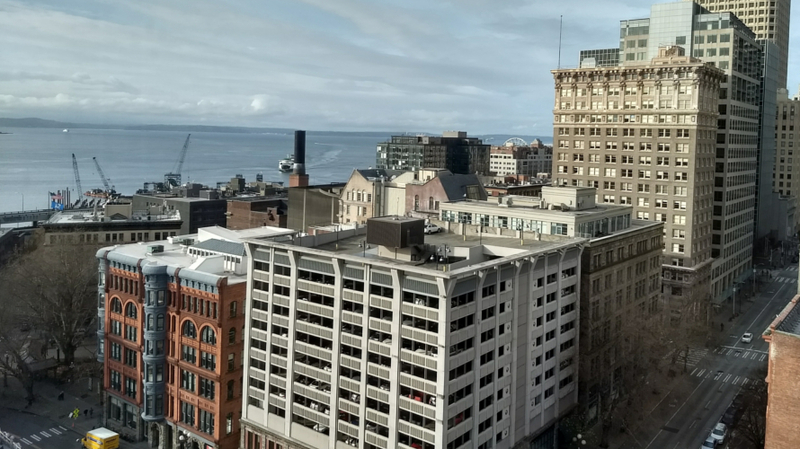 We also wanted to have physical office and meeting space on-demand in Seattle. To that end, I checked out a few co-working locations (yet another example of the rapidly changing world) that offer deskspace and meeting rooms. We like Starbucks too, but for a little more business focus these options are pretty great, we think. 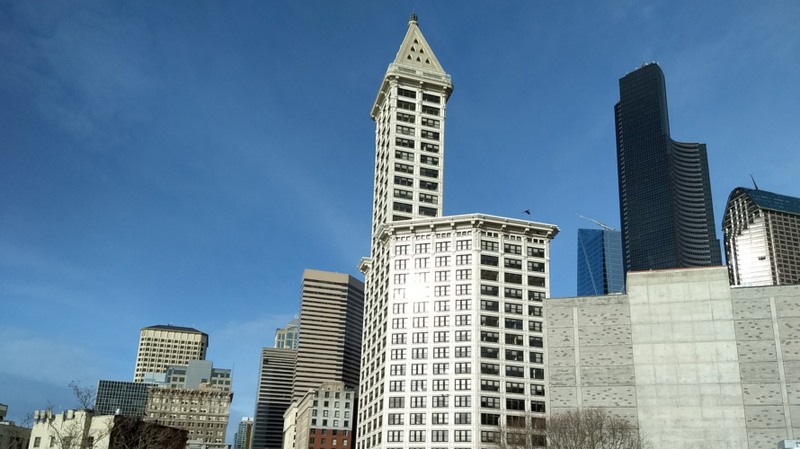 We now have a mailing address at the historic Smith Tower in Seattle (Fun Fact: it features the last working old-style elevators that require an elevator operator). I also toured ImpactHub and Galvanize. Both offer desk space, Wi-Fi, meeting rooms, and printers. Galvanize seems to have more in the way of mentors and advisors from Seattle start-ups and established companies that have offices here in Seattle (like Facebook and Google), so I intend to check this out a little more. We might also change our mailing address to one of the co-working locations. Our current address will be updated on our site. Let us know what you think, if you have input or suggestions, or your own experience to share.